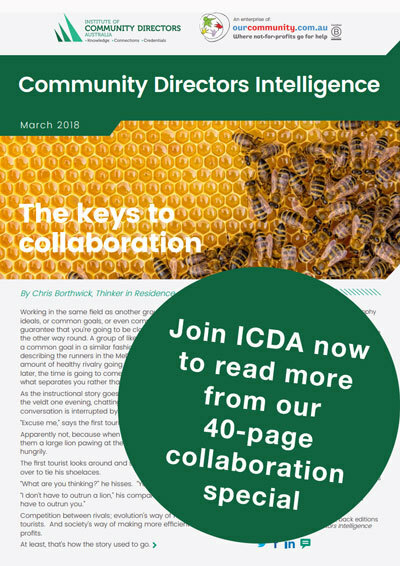 This is an extract of a three-part special report that first appeared in ICDA's member magazine, Community Directors Intelligence. To read the full report, become a member now. Not-for-profit-law experts Moores say collaboration could be the answer for organisations that are reluctant to merge but still keen to reap the benefits of partnerships. At Moores' recent Not-for-Profit Sector Briefing, Moores principal Tony Rutherford explained that while mergers or acquisitions are "at the apex of what you can do with two or more organisations", there are other options that not-for-profits can consider. "There are a range of contractual measures that allow organisations to collaborate without formally merging to get the benefit of combining the resources and knowledge of two or more organisations." He also discussed non-contractual collaborations. Moores' latest examination of the options for organisations looking at ways to work together comes on the back of a previously published guide to mergers - Thinking Big: To Merge or Not to Merge - That Is the Question - co-produced by Our Community, Moores and Commonwealth Bank Not-for-profit Sector Banking. Here's a little more information about several of those options. Joint venture: Established by two or more organisations usually for a specific project. Under an unincorporated joint equity structure, the organisations remain as separate entities and the relationship (including management, liability and funding) is governed by a joint venture agreement. Each party has defined interests and is usually liable for its own debts, which it incurs individually. A joint venture can also be set up as an incorporated entity. This could involve organisations injecting a small amount of equity into a new, jointly owned corporate entity. Being a company, the entity can enter into contracts or hold property, but it is also subject to the Corporations Act. Partnership: Similar to a joint venture, except the parties have joint interests in the projects, and are jointly and separately liable for the expenses of the project. Co-location: Two or more organisations agree to share common premises, resources (such as IT equipment and telephone services) and facilities. Co-location can facilitate the sharing of knowledge and referrals. Co-operative: A legally recognised entity where members have equal status and voting rights (i.e. one member, one vote). Shareholders, managers and employees generally have no responsibility for debts unless caused recklessly, negligently or fraudulently. Start-up: As an alternative to the options above, your organisation might consider investing in a start-up, bringing across your organisation's skill, expertise and contacts. Delving into examples of organisations that have worked together to increase their impact, Mr Rutherford cited the Southern Grampians & Glenelg Primary Care Partnership, which shared knowledge between partner organisations to more broadly examine and tackle social issues in south-west Victoria. Similarly, Big Brothers Big Sisters of America joined forces with Boys and Girls Clubs of America to link mentoring and development programs across the two organisations. "That cross-pollination that you get from having people with different skill sets and different experiences, allowing you to do things in a different way, can be really beneficial to those organisations. " Collaboration can also boost joint fundraising efforts, or access to funding, such as when eight of Australia's state-based spinal cord injury organisations created the Australian Spinal Injury Alliance. While each group remains independent, they can represent people with spinal cord injuries nationally. "Sometimes, the government will prefer to work with combined organisations, whether that's a formal merged organisation, or whether it's on a joint venture or consortium basis," Mr Rutherford says. Not-for-profits can also reduce their capital expenses and ongoing costs by sharing back office functions such as IT, finance and payroll, or by sharing office space, including heating, lighting and fixed office equipment. Mr Rutherford says "start-up" not-for-profits can make collaborations work for them. He cites the example of Maddie Riewoldt's Vision, established by St Kilda AFL star Nick Riewoldt to raise funds for the rare blood cancer that killed his sister. Maddie Riewoldt's Vision is "powered" by the Snowdome Foundation, a DGR-status charity that aims to "unlock new treatments". He says there are clear benefits for smaller organisations able to benefit from the established corporate governance, back office costs, structures and resources of larger organisations. "There are ways you can make it work early on, even when an organisation is starting from scratch." Mr Rutherford says arguments both for and against increased mergers continue to be heard in the sector. One view is that there are "too many" not-for-profits, and that this creates confusion and wastes resources. Some point to a 2010 Productivity Commission report that suggested the sector "should be more open to the possibilities of restructuring for forging new ways of collaboration". The flipside is the argument that innovation is needed to fix entrenched problems. And that often requires the creative initiatives of smaller, more nimble not-for-profits, he says. Collaborations can address the "too many NFPs" concerns to some extent, and also avoid the pitfalls of full-scale mergers and cultural clashes between organisations. FREE RESOURCE: Thinking Big: To Merge or Not to Merge - That Is the Question.